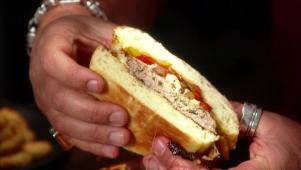 Guy Fieri puts his spin on turkey burgers: with roasted chiles mixed into the grilled patties, sauteed onions, peppers and a layer of monterey jack cheese, all piled on toasted brioche buns ... it is out of bounds! 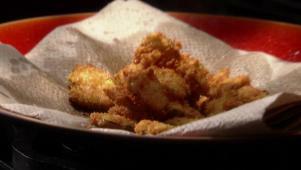 On the side, Crispy Fried Pickles: coated in panko breadcrumbs and served with homemade buttermilk dipping sauce. To wash it all down, a Roasted Jalapeno Margarita. A little spicy, a little sour, and extremely dynamite delicious.